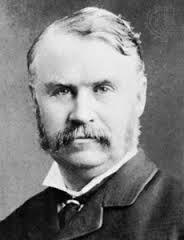 Today in Masonic history Sir William Schwenck Gilbert passes away in 1911. Sir William Schwenck Gilbert was an English dramatist, librettist, poet and illustrator. Gilbert was born in London, England on November 18th, 1836. His father, William, was a writer and early on in Gilbert's life he would illustrate some of his fathers works. The family traveled quite extensively in Gilbert's early life. Some of his early education happened in France. In later years, he would write his journal entries in French so the household staff could not read his entries. Gilbert graduated from King's College London in 1856. After graduating Gilbert intended on joining the military, with the Crimean War winding down there was less of a need for the Royal Artillery position he sought so he he decided against military service and turned to civil service. For 4 years he was an assistant clerk for the Privy Council, he hated every minute of it. In 1859 Gilbert joined the Militia, a part time volunteer force for British defense. He would stay with the Militia until 1878 achieving the rank of Captain. From 1861 on Gilbert wrote for a variety of publications under the pseudonym "Bab", a childhood nickname. Gilbert primarily wrote for the magazine Fun. In 1870 he would be sent to France to report on the Franco-Prussian war. During this period Gilbert's writings became very popular and he eventually published a book with a collection of his writings called Babs Ballads. The poems were illustrated by Gilbert and would serve as inspiration for many of his plays and comic operas. In 1871 Gilbert first worked with man who would become his collaborator on what is referred to the Savoy Operas, Sir Arthur Sullivan. Although they would not work together again for another 4 years, when the partnership would truly begin, their first collaboration was a success. The play Thespis would out run 5 of it's 9 competitors. In late 1874 Sullivan would be called in to put music to a comedic sketch that Gilbert had written called Trial by Jury: An Operetta. The pair would work together until 1896 when the stress of their opposing personalities and world views would end the partnership. "His kindness was extraordinary. On wet nights and when rehearsals were late and the last buses were gone, he would pay the cab-fares of the girls whether they were pretty or not, instead of letting them trudge home on foot... He was just as large-hearted when he was poor as when he was rich and successful. For money as money he cared less than nothing. Gilbert was no plaster saint, but he was an ideal friend." Gilbert passed away on May 29th, 1911. Gilbert was initiated into Lodge St. Machar No. 54 in Scotland, while on maneuvers with the Militia. In 1876 after his return to London he joined Bayard Lodge No. 1615.